The following electrical symbols, showing some standard VHF, UHF and SHF symbols for electrical schematics such as discontinue, equivalent series, capacitate reactance, inductive reactance, resistance, E-H tuner, gyrator, circulator fixed, etc. The following electrical symbols show some standard VHF, UHF and SHF symbols for electrical schematics such as discontinue, equivalent series, capacitate reactance, inductive reactance, resistance, E-H tuner, gyrator, circulator fixed, etc. Every WHF, UHF, SHF symbols can be configured by the action button. The following electrical symbols display some vhf symbols such as resistance, inductance capacitance, equivalent shunt, capacitive susceptance, inductive susceptance, slide screw tuner and E-H tuner. 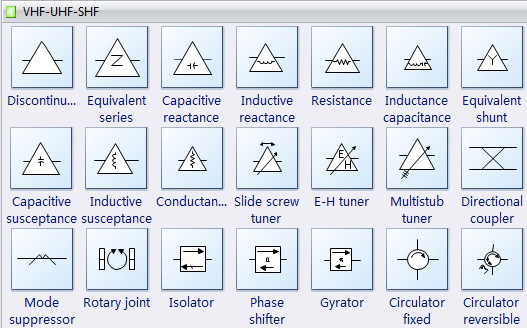 The following electrical symbols present some uhf symbols such as multistub tuner, directional coupler, mode suppressor, rotary joint, isolator, phase shifter, gyrator, circulator fixed, field polarization, etc. The electrical symbols below layout some shf symbols such as balun symbol, mode filter symbol, frequency filter, phase shifter, ferrite bead ring, line stretcher, etc. In our System Diagram Software, you can use the action button to choose the right electrical symbols with one click.